Pope Francis had invited 1,500 poor and marginalized people—cared for by Mother Teresa’s Missionaries of Charity across Italy—to attend the canonization. He not only gave them privileged places at the ceremony but afterward invited them to a lunch of Neapolitan pizzas in the atrium of the Paul VI audience hall. In his homily, Pope Francis praised this great woman with whom he has so much in common. “Mother Teresa, in all aspects of her life, was a generous dispenser of divine mercy, making herself available for everyone through her welcome and defense of human life, those unborn and those abandoned and discarded,” he said. 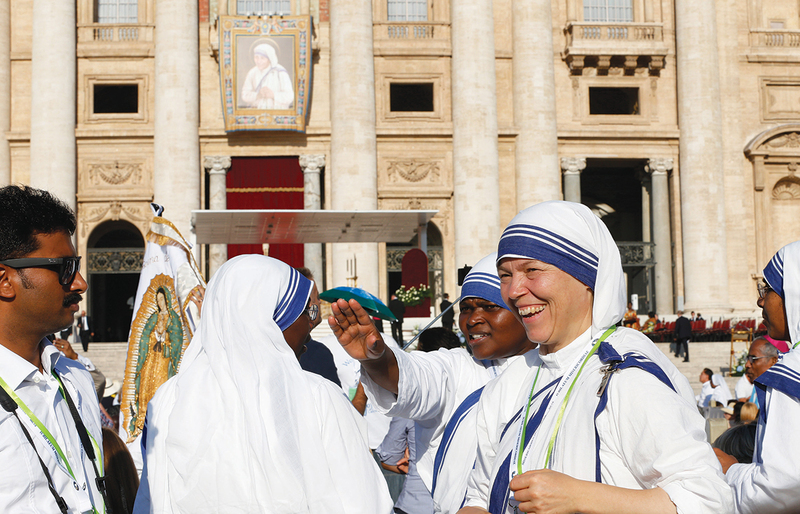 Last December, Francis decided to hold the canonization of Mother Teresa on the Jubilee for Workers of Mercy and Volunteers, a day when those volunteers and workers from all over the world came to Rome for their part in the Jubilee Year of Mercy. The pope sees Mother Teresa as an icon of mercy for the modern world. When he finished speaking, the crowd broke into thunderous applause. Then, after prayers in different languages, Francis went on to concelebrate Mass with the more than 70 cardinals, 400 archbishops and bishops and 1,700 priests present at the ceremony. The crowd included numerous women and men religious, including many members of the Missionaries of Charity. Following the liturgical tradition, a few of them placed a blood relic of Mother Teresa near the altar immediately after the canonization. The presence of these delegations, which included representatives of different faiths, was hardly surprising, given that even during her lifetime, Christians and followers of other religions—Hindus, Sikhs, Jews, Muslims and Buddhists and many people who do not profess a religion—considered this extraordinary woman a saint. When she died on Sept. 5, 1997, India recognized her greatness by giving her a state funeral. Now, 19 years after her death, the Catholic Church has officially recognized her as a saint. She is the first Nobel Peace Prize winner to be so honored. This article also appeared in print, under the headline "As Thousands Cheer, an Icon Of Mercy Is Canonized in Rome," in the September 19, 2016 issue.